While I may not have travelled across international boundaries or at months at a time. I’ve done my share of travel by motorcycle and camped along the way. Little did I know at the time, that what I was doing was overlanding. As anyone knows, social media is great for, well, being social. It was through Facebook that I had made friends with people who are involved in the Overland community. When I saw a call for volunteers at the Overland Expo East which was the week of my birthday, I jumped at the opportunity. What more could I ask? A road trip from Harrisburg, Pennsylvania to Asheville, North Carolina to attend an awesome event! At the time I had a 2009 BMW F650GS Twin. The bike was great on the road, and lots of fun on forest roads. I loaded up the bike with my four-season tent, sleeping bag, sleeping pad, clothes, food, camera gear, and camp stove and headed south. The trip was broken up into two days with Roanoke, Virginia as the rest stop. The Blue Ridge Parkway makes for a beautiful route when time is on your side. 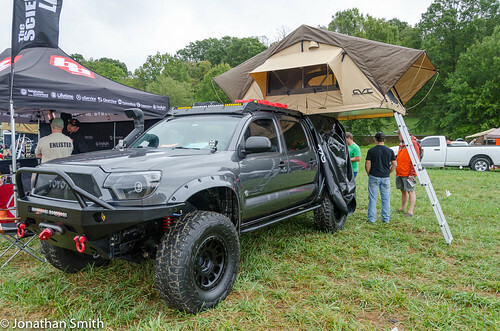 Check out my full photo gallery from Overland Expo East 2016 on Flickr. Arriving at the Biltmore Estate for Overland Expo East, I was greeted with some of the friendliest people I’ve ever met. It quickly felt like family as I set up my camp for the next few days and socialized with my camp neighbors. We dealt with rain, wind, and cold mornings by helping each other with anything that needed done. Big thanks to my camp neighbors who have refrigerators in their vehicles for providing me cold water during those warm first days. Over the course of the event I was able to see so many amazing vehicles setup for off-road, travel, and independence. It didn’t take long for me to decide to sell my motorcycle and buy a truck. The conversations I had with Toyota Tacoma owners, and the tours they gave me of their vehicles really inspired me. It was clear to me that a Toyota Tacoma would make for a great foundation to build a vehicle that would allow me to travel in any type of weather, with my dog, and live independently on the road. Much more so than the motorcycle. After arriving home from Overland Expo I received a message from a friend asking if I wanted to sell my motorcycle. Was it a coincidence? Within a week of returning home I sold the BMW motorcycle. And within another week I traded my 2014 Honda Civic EX coupe on a 2014 Toyota Tacoma TRD Off-Road truck. This is the beginning.